Good morning fellow scrappers! Hmmmm, seems like almost a whole month has flown by & I've been a bit quiet. Well, you can blame work for that. I've been a bit swamped since I went back. I've made it a point to keep my sanity by taking the time to scrap here n' there--I just haven't had the chance to post any of it! So, to start myself off here's a DT card I've made for Authentique. I've used their lovely papers from the 'Remembrance' collection. 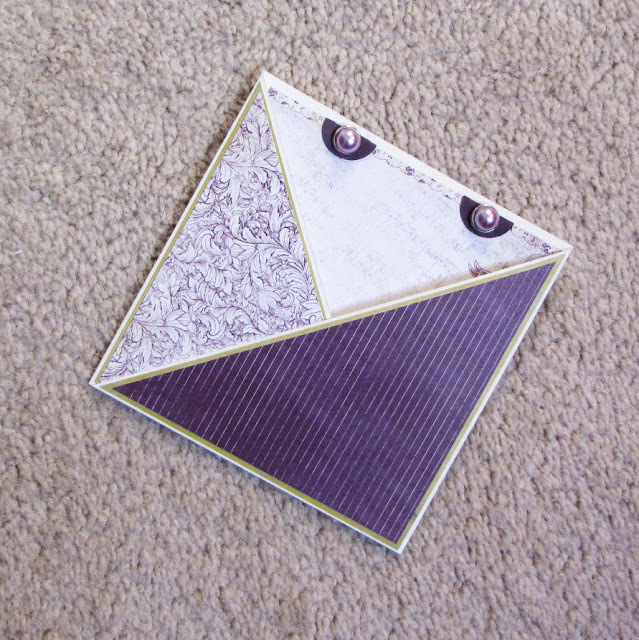 I've decided to go with a non-traditional card & opted for what is called a 'criss cross' card. 'Remembrance' is one of Authentique's petite collections full of beautiful papers in shades of deep purple & olive greens with elegant patterns and sentiments of sympathy, thoughtfulness, and good memories. 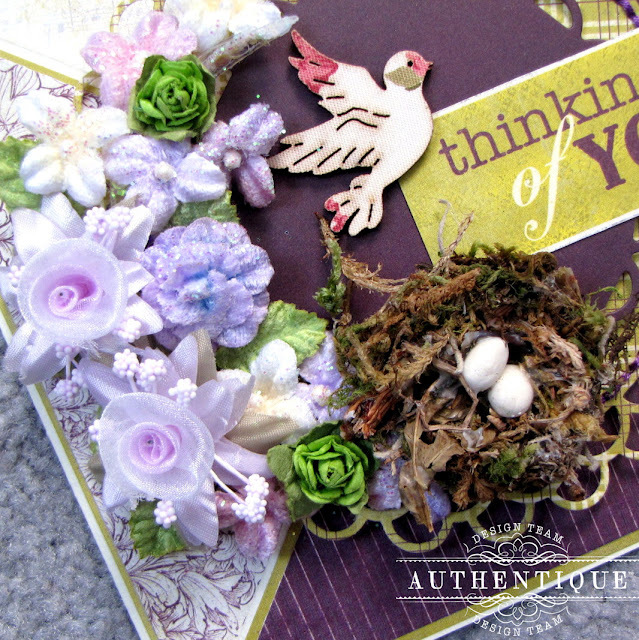 These papers can be used for sympathy cards, to honor memories of loved ones who has since left us or to pay tribute to a dear family member or friend. There are several tutorials and how to's on the internet on how you can make your own criss cross card. I simply decided to add to this collection of tutorials with my own version. 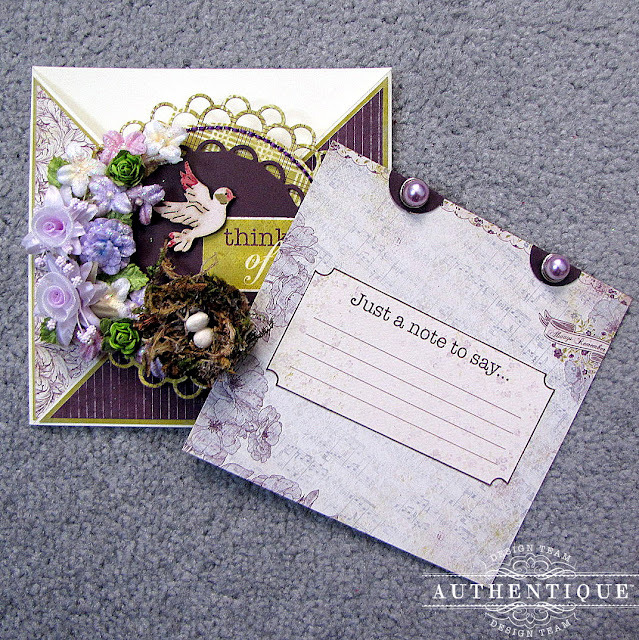 What I like about the criss cross card is that it's essentially one large pocket that you can embellish as desired with a sentiment that easily slides in & out of the card. It's not a complex card to make if you wish to go with a slightly different sort of card. Here is what the inside sentiment of the card looks like. Following are a couple of close ups. 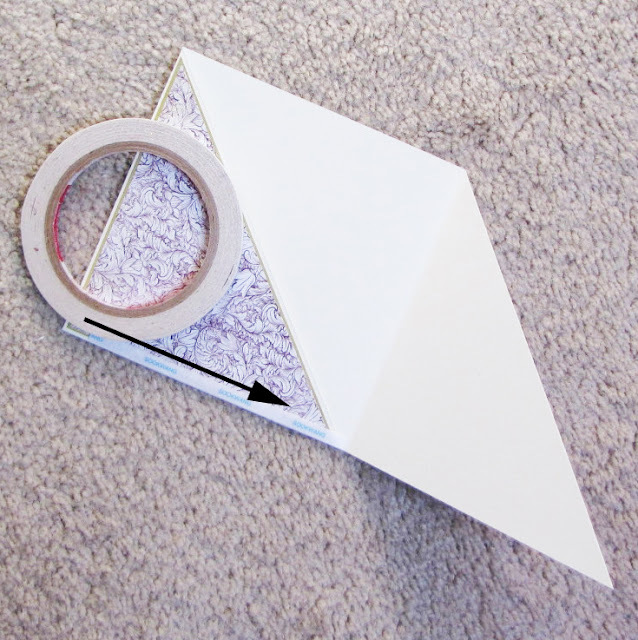 Step 1: You'll need 1 piece of solid colored card stock cut in 1/2. A 5 3/4" x 5 3/4" piece of contrasting paper & two 5 1/2" x 5 1/2" pieces of coordinating paper. Step 2: Score the two 12" x 6" pieces of card stock in half. 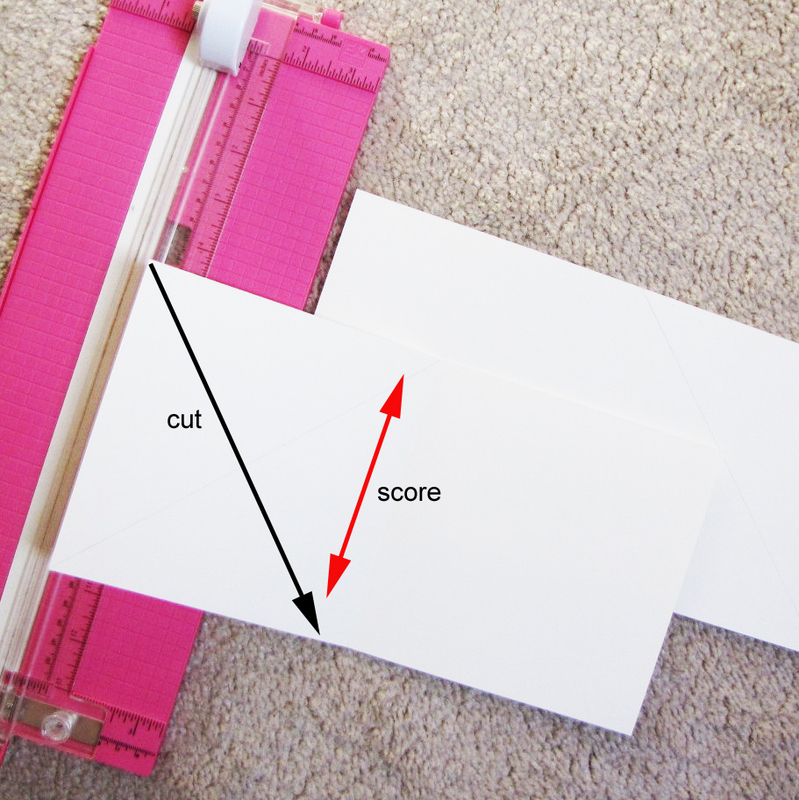 With a trimmer, scissors or craft knife you will then need to cut at a diagonal from one corner of the card stock to the bottom corner of the center fold. TIP: The photo came out a bit too bright to see this, but with a pencil & a ruler I lightly draw a line marking where I intend to cut. This serves as a guide so that I don't cut way off. You will repeat this step on the other piece of 12" x 6" card stock. 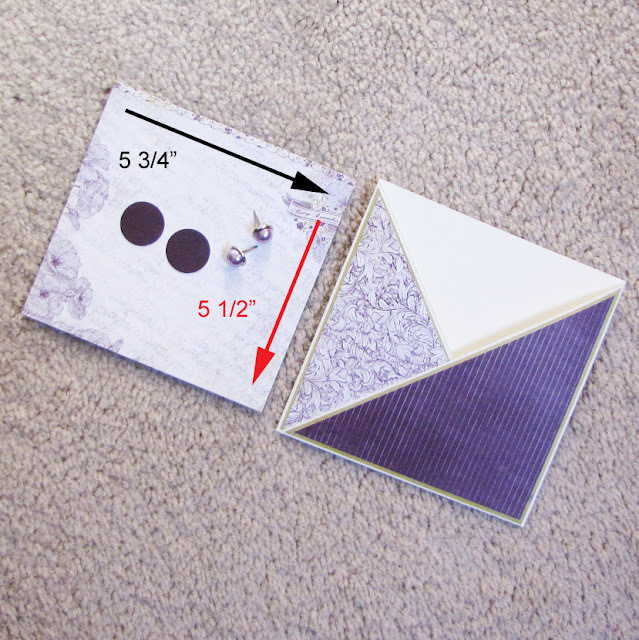 NOTE: when you cut the second piece of card stock make sure you do so on the opposite side so that when you join the two pieces of card stock the two middle sections will overlap to the form the base of your card. Step 3: When you adhere the two 12"x6" pieces of card stock--this is what they should look like. 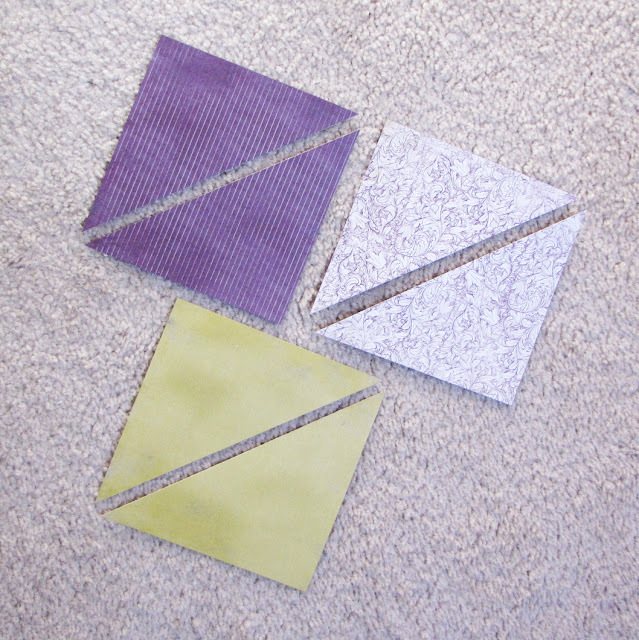 Step 4: Cut all of the remaining pieces of paper diagonally as shown. Once again I first drew a line lightly as my guide with a pencil & ruler prior to cutting. I don't know about most of you but I'm very lopsided! I can never just cut away without some kind of guide! 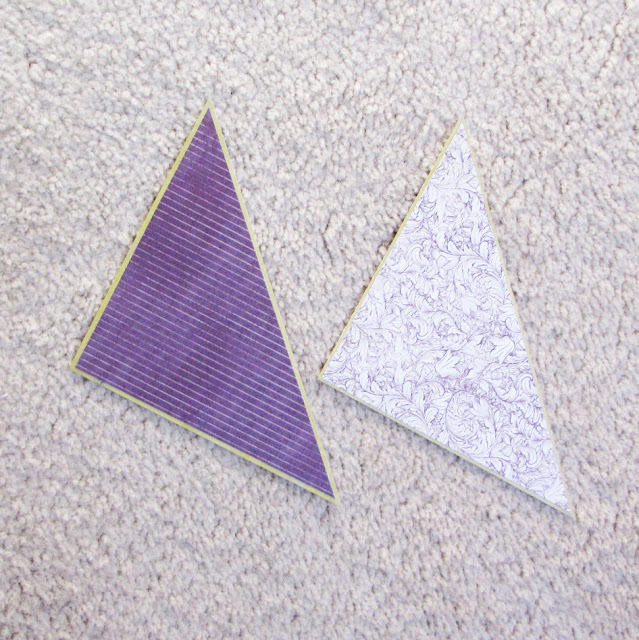 Step 5: Adhere the patterned paper to the contrasting piece of paper. You will have the other halves of the patterned paper left over. Keep these for future projects. NOTE: If you do not wish to have leftovers or if you want your card to have just one design--simply use one piece of 5 1/2" x 5 1/2" patterned paper cut in half diagonally. Step 6: Take the two triangles and adhere them to the base of the card as shown. At this point you have your criss cross card pretty much done. All that's left is to glue it closed & decorate it! Step 7: With two sided tape (or glue with a fine tip) place one strip on the base of the card at the very bottom to adhere the first flap. Then take a second strip of tape & place it on top of the first flap to adhere the second flap as shown here. 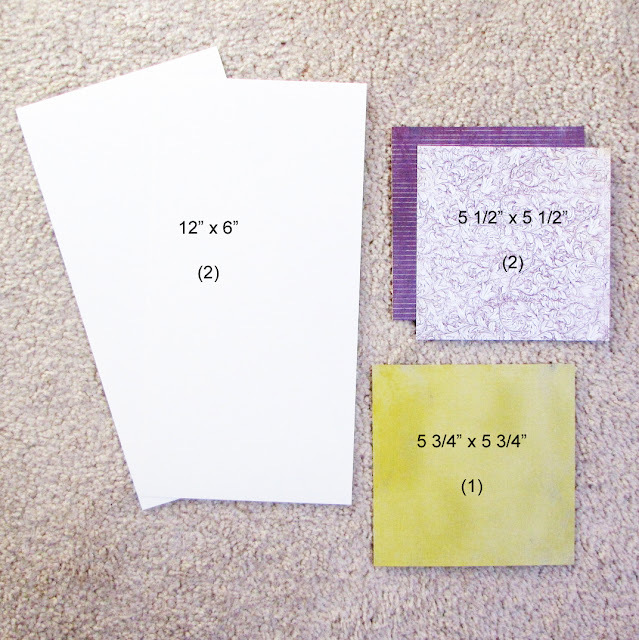 Step 8: For the inside of the card you'll need 1 piece of patterned or solid colored paper (whichever works best for your project) sized 5 3/4" wide by 5 1/2" high. This next step is optional--to make the tabs with the brads seen on my card simply take a 1" circle punch & punch out 2 circles--fold them in half, pierce a small hole into one half of the circle, attach the brad & finally adhere to the card. Step 9: Here's your finished card. Now just embellish away! Very pretty! Hop the family's fine!